With April upon us and rain in the forecast, I didn’t want to wait to get plants and seeds in the ground. This year it is tomatoes, yellow bell peppers, cucumbers, cantaloupe, and yellow squash (at Abby’s request), surrounded by a ring of marigolds. The answer is simple: I am a machine. Also based in the forecast, I might have some peaches, cherries and plums this year. 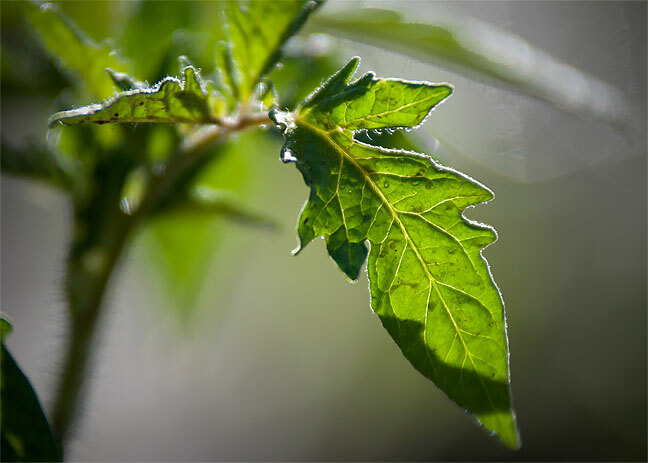 This tomato leaf soaks up warm spring sunshine in my garden after today’s planting. A highly evolved machine too. Well done. And I gardened with – quite literally – one hand tied behind my back. Clearly we come from a long line of machines. By the way … need trip report. I’M. JUST. SAYING.